Ecosure sprayer tanks are rotational moulded from industrial strength MDPE (Medium Density Polyethylene) using the latest in UV stabilization technologies. The NEW Ecosure 5300 litre water tank comes fitted with a 16" lid and a 1" or 2" BSP fitting located at the bottom of the tank inline with the lid. 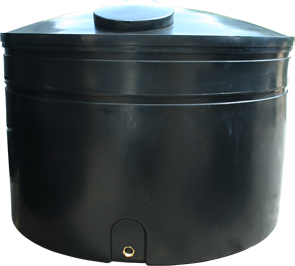 If your looking to store potable / drinking water then you should use the 5300 litre potable water tank . Also is low in height making this water tank ideal for easy filling and easy tank access for pump installation.